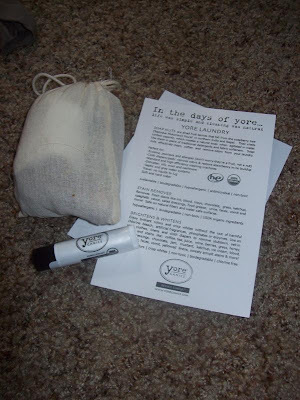 I was sent a laundry sample pack from Yoreganics to review. I was sent the Brightens and Whitens, Soap Nuts, and Stain Remover. I think that this brand is very cool because it is natural and simple! I also got to try out one of their chapsticks and it was awesome! It has a fresh mint smell which is my favorite smell for lip balm. You may ask, what are soap nuts? They come from the soapberry tree and have a natural soap called saponin when agitated in water. I think that this is so cool and was very excited to try them! I was impressed with the cleaning abilities of all of these products. I was able to try them out this weekend when Troy (husband) was working and I was trying to get some chores done. Thanks Yoreganics for your awesome natural laundry products! I've subscribed to your cool blog. I anticipate learning quite a bit from you! I learned what 'soap nuts' were today! Thank you for the follow, following you back from at Ma21cuteboy!